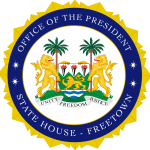 State House, Freetown, Friday 1st June 2018 – His Excellency President Julius Maada Bio has said his administration will review conditions of service for the military force and strengthen its personnel to be effective in providing the required security support to the state. While addressing this year’s Passing Out and Commissioning Ceremony for the Republic of Sierra Leone Armed Force (RSLAF) at the Benguema Training Center, the President, who was a former military chief, affirmed that officers could perform better when their welfare was well taken care of. As Commander-in-Chief of the Armed Forces, he said his government was concerned about the poor conditions of service for soldiers and promised to provide the necessary support that would enable them to operate efficiently. “Since my assumption of office, I have been briefed about the serious nature of challenges the RSLAF continues to face like the unrevised Terms and Conditions of Service. I have already paid premium attention to the issue of poor and inadequate accommodation facilities. The military is under resourced. As one of your own, I know exactly how these challenges can undermine capacity in the force. Let me once again assure you that my administration will do all in its power to ensure that these challenges are gradually addressed,” he assured. President Bio also used the opportunity to thank international partners for their support in capacity building and enhancement of military personnel in the country, adding that his government would continue to support capacity building for officers while making them a modern institution. “As I continue to solicit your support, my government is committed to ensuring adequate investments in basic domestic training as a key foundation to advancing professional training,” he said. The President also praised the entire membership of RSLAF for the professional manner in which they had conducted themselves, especially during the just concluded elections, adding that his government looked forward to their professional support in his new direction programmes. His Excellency, who has always promised to depoliticise state institutions again admonished the graduating soldiers that their business in the military was to provide security to the people and not to engage in politics. He said military officers should not allow themselves to be influenced by politicians, irrespective of personal relationships. “In the new world today, the role of the military is to support the development of democracy and democratic consolidation. Therefore, in a democracy, the military must remain apolitical. The military has no business in politics and politicians must take politics out of the military,” he concluded.